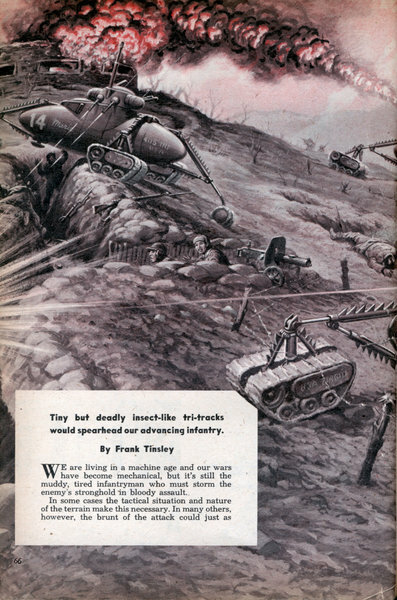 Tiny but deadly insect-like tri-tracks would spearhead our advancing infantry. 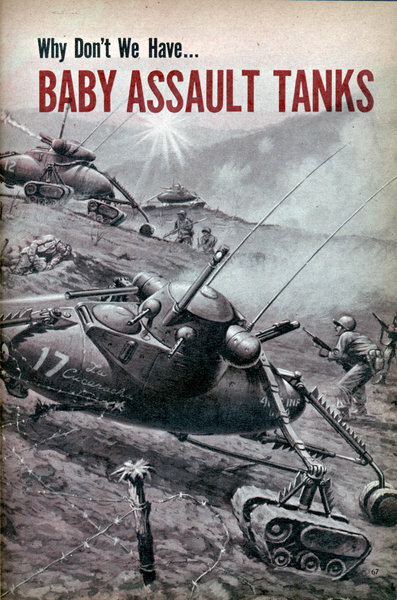 By Frank Tinsley WE are living in a machine age and our wars have become mechanical, but it's still the muddy, tired infantryman who must storm the enemy's stronghold in bloody assault. In some cases the tactical situation and nature of the terrain make this necessary. In many others, however, the brunt of the attack could just as well be absorbed by light, heavily armed machines. Why, then, can't we send in a first wave of baby assault tanks and use our irreplaceable GI's for the less hazardous chore of mopping up? 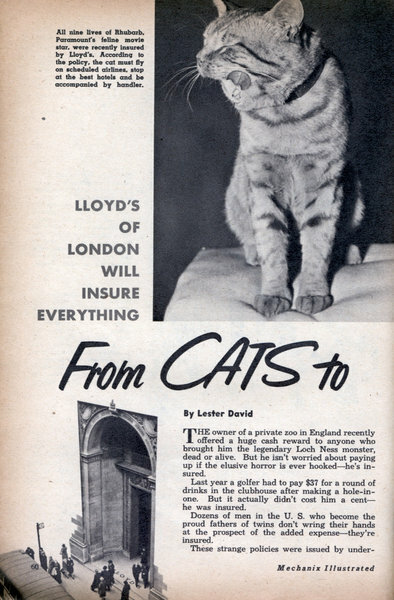 LLOYD'S OF LONDON WILL INSURE EVERYTHING By Lester David THE owner of a private zoo in England recently offered a huge cash reward to anyone who brought him the legendary Loch Ness monster, dead or alive. But he isn't worried about paying up if the elusive horror is ever hookedâ€”he's insured. Last year a golfer had to pay $37 for a round of drinks in the clubhouse after making a hole-in-one. But it actually didn't cost him a centâ€” he was insured. Dozens of men in the U. S. who become the proud fathers of twins don't wring their hands at the prospect of the added expenseâ€”they're insured. By Harry Kursh AMERICA'S fastest growing small-business opportunity is also America's most underestimated! Few people know that a group made up of two per cent of the American working population managed to make over $7 billion last year in door-to-door selling. This fabulous figure was more than double the previous peak year. If you're not afraid to knock on doors, you can claim your share, too. 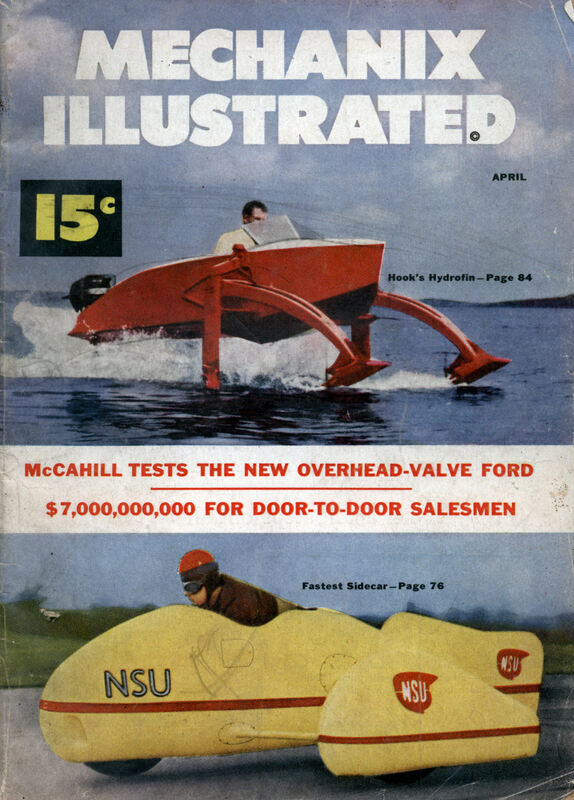 The door-to-door selling boomâ€”for which an even bigger year is predicted in 1952â€”is opening the door for thousands to become independent, self-employed salesmen, selling practically anything a family can use. 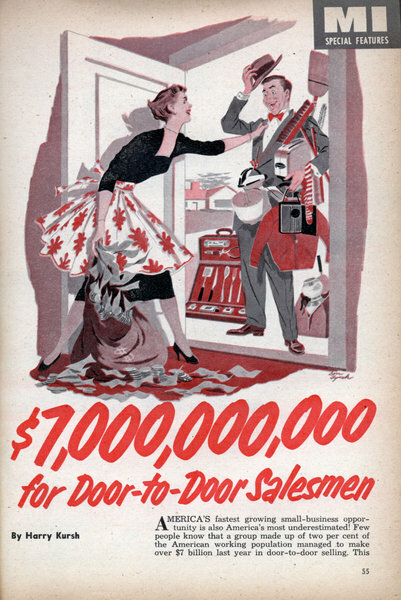 Already more than 3,000 firms have men and women going from door to door for them to sell everything from nylon stockings to fire extinguishers. Don't say doughnuts to the Pelton brothers, say Spudnuts. 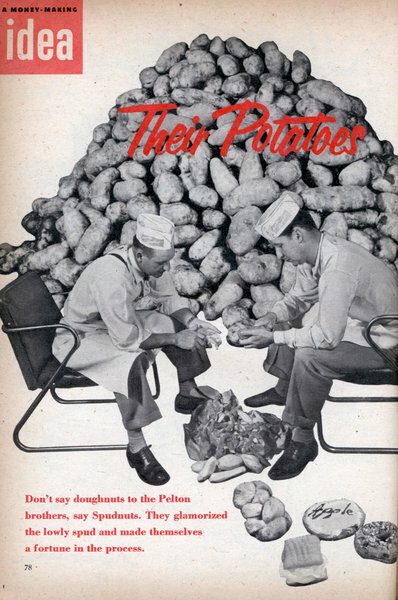 They glamorized the lowly spud and made themselves a fortune in the process. By H. W. Kellick AL and Bob Pelton were suckers for sinkersâ€”doughnuts, that is. They'd eaten glazed doughnuts, chocolate covered doughnuts and just plain doughnuts. 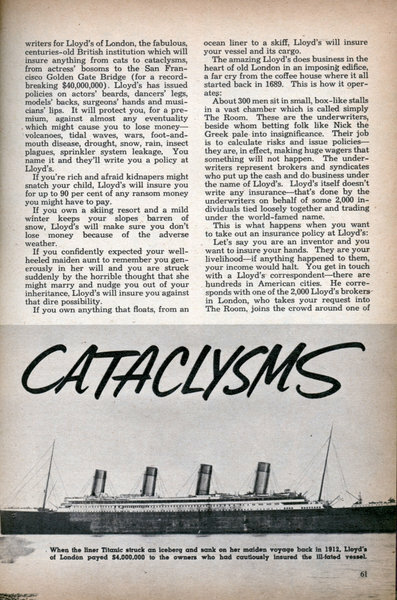 They were also eager to make lots of money and doughnuts got them to thinking. "Why can't we invent a new kind of doughnut?" Al said one day over a cup of coffee and a doughnut. Just like that. Today, the brothers Pelton never mention the word doughnut. Say Spudnut and you'll draw a smile from them, though. For they're out to supplant the common doughnut with their million-dollar ideaâ€”a delicious potato pastry. As a matter of fact, the Peltons are now selling more than three-quarters of a million dozen Spudnuts per month. To date they've franchised 350 shops throughout the United States, Canada, Alaska and Hawaii. Around-Corner Barrelis sub-machine type and shoots at 90Â°. It fits the Army’s M-3 and fires .45-caliber bullets at the rate of 450 per minute. 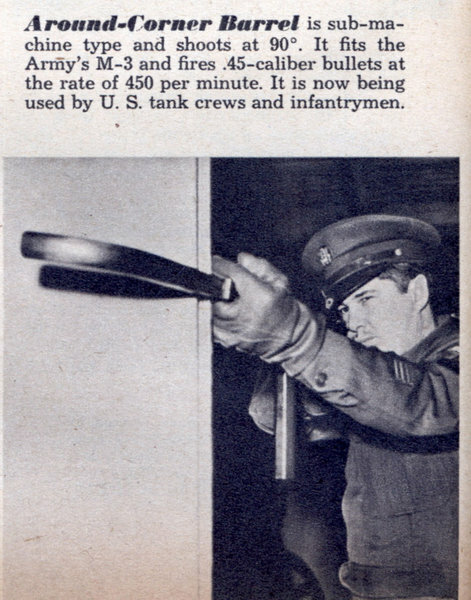 It is now being used by U. S. tank crews and infantrymen. Wow, that thing is TINY! And the antenna is only 4 feet! Tiny Mike shown below is being used in movie sequences where microphones are difficult to conceal. 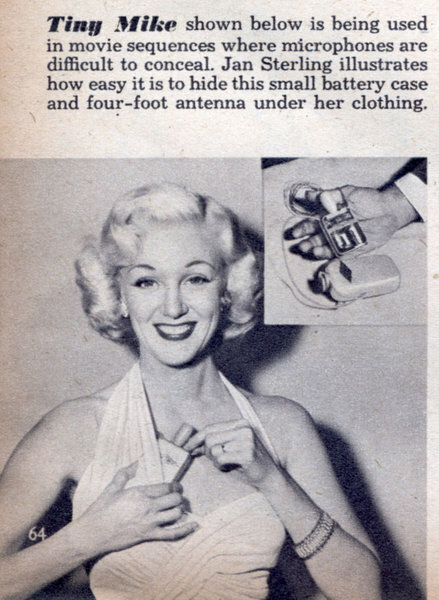 Jan Sterling illustrates how easy it is to hide this small battery case and four-foot antenna under her clothing.